A human limb was found at a recycling plant in Ballyfermot late last night. Gardaí at the scene this morning. 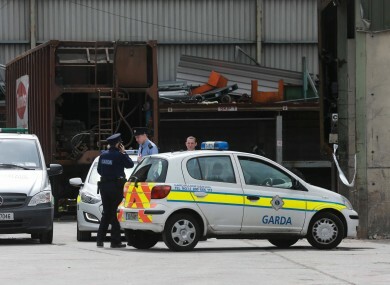 A MEDICAL EXAMINATION is due to be carried out on human remains discovered at a recycling plant in Dublin. A human limb was found at the Thorntons Recycling centre on Killeen Road, Ballyfermot just before midnight last night. An area of the centre has been sealed off to facilitate a forensic examination of the scene. The examination of the remains is due to take place at Tallaght Hospital and a garda investigation into the incident is underway. Email “Examination due on human remains found at Dublin recycling plant”. Feedback on “Examination due on human remains found at Dublin recycling plant”.